9 additional avatars have been uploaded to the 'TESO' avatar gallery folder, including Skald-King Jorunn, Queen Ayrenn, and High King Emeric. The Who's Online list has been changed. It now shows avatars next to registered users, along with a couple of other template changes for aesthetic reasons. Article comments have been made to more closely resemble forum posts. Next will be changing the video comments to look the same. EDIT: Video comments are now completed. Article slider added to the main page, as previously many people didn't notice when new articles were released. View New Posts, View Today's Posts, and Mark Every Topic As Read have been moved down to the bottom of the forum. Guestbook Comments have been spiffed up a little. We can now use MyCode and style our Profile pages a lot easier (the About Me section). Visit your Profile Settings to update this if you wish. An editor toolbar like the one in the Full Editor has been added to make things easier for you. I don't know what faction I want to be yet. I like them all. (November 4th 2012, 11:34 AM)Vampero Wrote: I don't know what faction I want to be yet. I like them all. YouTube videos are now larger to suit the forum more. 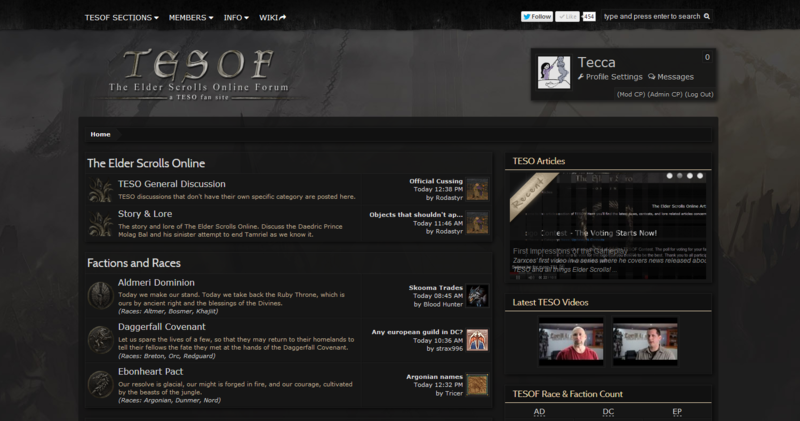 Articles, Videos, and Guild links have been added to the footer of the site. -Replaced old logo with contest winner's logo. -Navigation now scrolls down the page with you. -Articles, Videos and Guilds links have been removed from a drop down and placed as top-menu items. -Highlighting text around the site now has a different selection background (#212121 rather than your browsers default). -Search bar in navigation has been placed with a SEARCH TESOF link. This is an advanced search and easy to use. -Opacity on mini-profile card has been change back to full (1). This allows Notices to not have the opacity (easier to read). -Table headers (thead) have been changed back to how we originally had them, with the text made larger and colored silver. -Some links/text changed from gold to silver. We now have more of a Gold > Silver > Black theme rather than Gold + Black. -Background image is slightly more visible. -Several other minor edits that I can't recall. -Also, videos section (as you may have already read/seen) has been given a dropdown/filter. Maps in the Guilds section have been changed. They were provided by Lobsel_vith. Thanks, they look great! Member list has been coded to display a card layout rather than a list. Background changed and a tile has been added. Some of the transparency has been scrapped for better readability. Other minor changes have been made, but you will not notice nor care for them. TESOF Team List has been updated to have a similar card-layout to our member list. If anything looks off, hit Ctrl+f5 on your keyboard to hard refresh the page. EDIT: Time and date has been added to private messages. Apparently, that information could only be seen in the list of messages before; You should now be able to see it while reading a PM as well. EDIT 2: Whenever viewing the first unread post or last post within a topic, after clicking the appropriate link, the fixed navigation at the top of the site will no longer cover up the persons username/the post date. Small detail, but helpful and a lot less annoying at this point. If you guys see anything wonky, please report it in the Help & Feedback forum.